NASA’s Human Exploration and Operations director William Gerstenmaier visited Michoud on June 21 to view progress at Michoud Assembly Facility and Stennis Space Center on the Space Launch System (SLS) and the Orion Multipurpose Crew Vehicle (MPCV) programs. The event included an all-hands meeting, the presentation of multiple Space Flight Awareness (SFA) and Silver Snoopy awards, and a ribbon cutting ceremony at Boeing’s Vertical Weld Center (VWC) that unveiled the new tooling to the public. 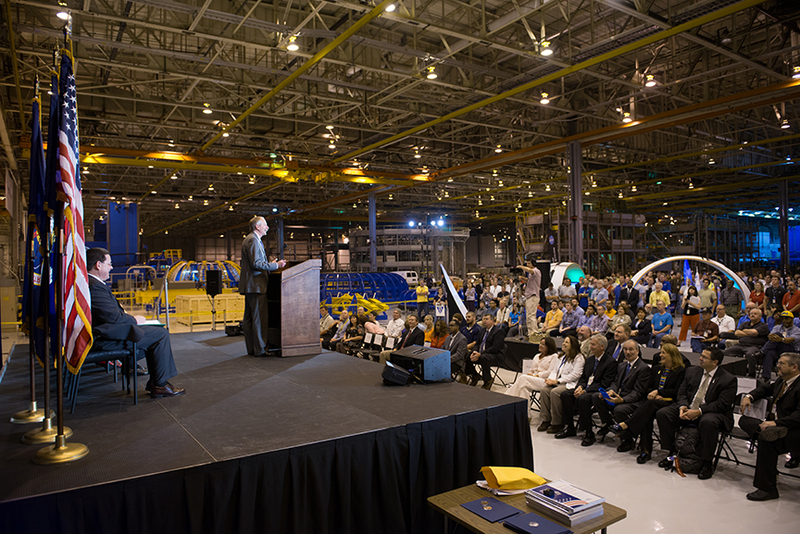 Human Exploration and Operations director William Gerstenmaier addresses NASA employees and contractors during an all-hands meeting held June 21 in Michoud’s expansive advanced manufacturing facility. Gerstenmaier visited Michoud to view progress on the Space Launch System (SLS) and the Orion Multipurpose Crew Vehicle (MPCV) programs. To kick off his visit at Michoud, Gerstenmaier held an all-hands meeting with Michoud employees. Roy Malone, Director of the NASA Michoud Assembly Facility, kicked off the event by introducing the speakers and welcoming the workforce. Gerstenmaier’s comments centered around his pride in Michoud’s workforce and the program successes our workforce has achieved. Gerstenmaier also addressed several questions from the audience before beginning the awards ceremony. NASA Astronaut Ricky Arnold took the stage and presented five employees with a Silver Snoopy Award. This award, presented on behalf of the entire NASA Astronaut Corps, is given to the awardee for “professionalism, dedication, and outstanding support that greatly enhances space flight safety and mission success.” Congratulations to Silver Snoopy recipients Rhonda Smitherman-Hickman (NASA), Gregory Folkes (Boeing), Albert Reville (Boeing), Greg Riddle (Boeing), and Donald Regan (Lockheed Martin). Next, two teams were recognized for their exemplary performance. The Safety Insta-gators, represented on-stage by member Debbie Marino, were recognized for their work in identifying and mitigating safety issues at Michoud and emphasized the team’s dedication to building a culture of caring within the workforce. The Launch Abort Systems (LAS) Fairing Manufacturing Team, represented by Jay Leighton, was lauded for their outstanding performance in the fabrication and delivery of the Orion Exploration Flight Test-1 LAS hardware. After concluding the employee appreciation event, Gerstenmaier led a ribbon cutting ceremony unveiling Michoud’s Vertical Weld Center, a tool used in the manufacturing of barrel sections of the SLS rocket. Also participating were, Patrick Scheuermann, director of NASA’s Marshall Space Flight Center; Roy Malone, director of Michoud Assembly Facility; David Doss, representing U.S. Senator David Vitter, Louisiana State Senator Jean-Paul Morrell, Representative Ray Garofalo, Representative Greg Cromer, and Virgina Barnes, Boeing’s SLS Program Manager. Barnes commented, “This program is exceeding expectations on all of the plans… I’ve never seen a program perform this well at this stage.” She recognized the work force for their superior performance and unwavering support for the program. After the ceremony, the participants were invited to tour the facility and view the progress being made on the SLS and Orion MPCV assembly line.